00:25:00 Makes 6 servings, 1 cup (250 mL) each. 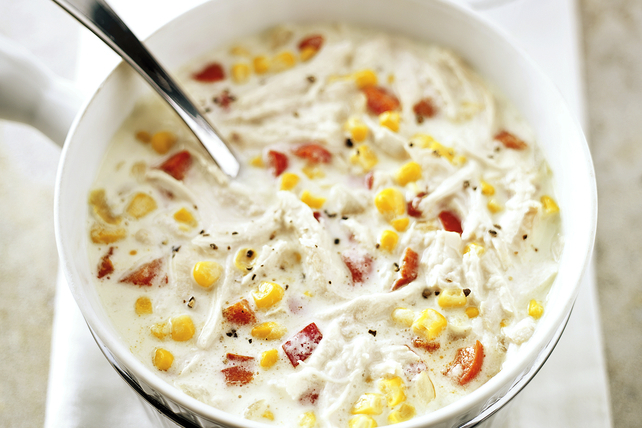 This hearty soup is thick and creamy, thanks to cream cheese and canned cream-style corn. Perfect for a quick dinner with only 10 minutes of prep. Cook 1/2 cup red peppers and onions in butter in large saucepan on medium heat 5 min. or until vegetables are crisp-tender, stirring frequently. Add cream cheese; cook and stir on low heat 3 to 5 min. or until melted. Stir in turkey, corn, broth and milk. Cook 5 min. or until soup is heated through, stirring occasionally. Serve topped with remaining red peppers and black pepper. For more robust flavour, roast and peel the red pepper before chopping and using as directed. Add to the soup along with the turkey, corn, broth and milk. Or, use chopped drained, jarred roasted red peppers instead. Prepare soup as directed; cool. Refrigerate up to 2 days. Reheat in microwave or on stove top before serving.